Recently I taught basket weaving to a group of pre-school students. 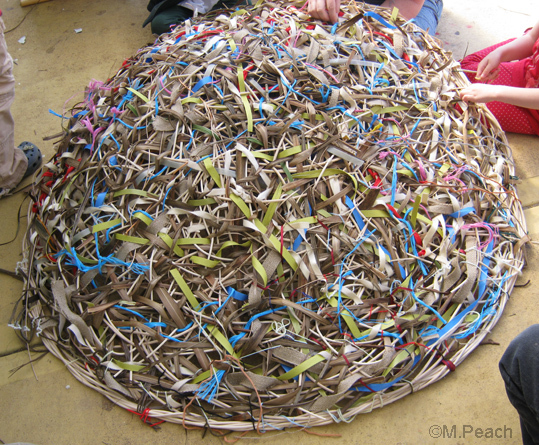 They wanted to make a giant bird’s nest for their school art exhibition. First I wove a broad frame for them to weave on, using 5 mm cane to make a shallow bowl about 1.5 metres in diameter. On the first day I taught the youngest children who were 3-4 years old. For this group I cut lengths of 4 mm rattan cane about 50-60 cm long, and we also used whole Cordyline australis leaves. About 5 students at a time sat around the nest and learned the basics of weaving. I was astonished at how adept they were, having expected children so young to struggle with the technique. 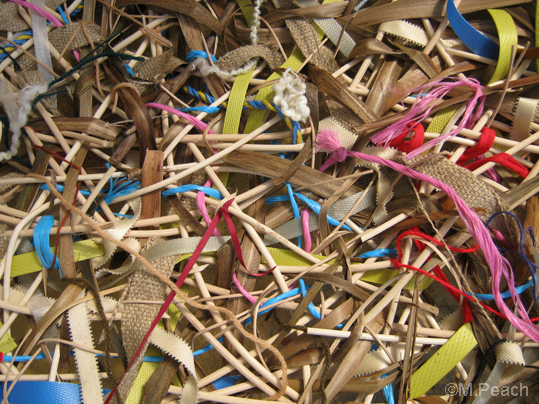 On the second day, with 4-5 year old students, we used 3 mm cane and rattan peel. By this time the holes in the basket were smaller, and it would have been too difficult to use thicker cane. 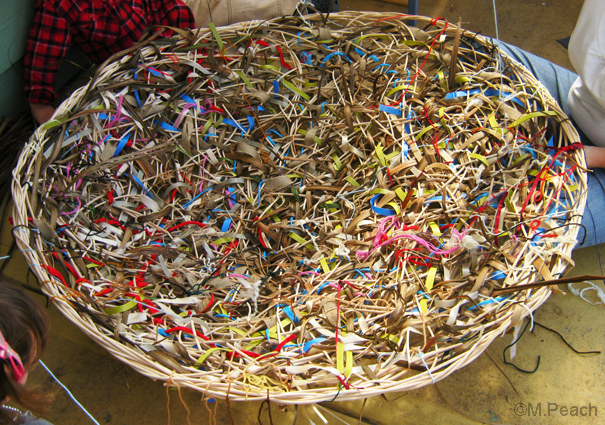 As well as the cane, we had a variety of recycled materials such as packing tape and baling twine, which some of the children found easier to use than the cane. They also liked the bright colours, and we talked about how birds will use whatever they can find in their nests, and how some birds (like bower birds) prefer certain colours. We finished off the nest by weaving and tying soft woolen pieces on the inside. it’s wonderful! what a fabulous lesson for the kids, both weaving and nature. thanks for the idea, i have a youth arts festival coming up, and am looking for several projects. i would love to use this idea, if you don’t mind! Yes feel free to use the idea. I am far from the only basketry artist making “nests”, so I don’t feel the idea particularly belongs to me. When teaching basketry the start is often the hardest part, so providing a framework to weave on is an easy way to get people into it, especially young kids. I just had a look at your website and I love your work too. I would really love to know how you wove the frame. I do not have previous experience with basket weaving but I would love to try this experience with some kindy children. Basket making is really something you need to learn in person, hands-on. It is often difficult to describe the techniques in words, or depict them adequately in still images. There are quite a few people teaching basketry workshops around Australia. My workshops are advertised on my website, http://www.sharkchic.com.au. There are also workshops regularly organised by Basketry SA (https://sites.google.com/site/basketrysainc/about-us-1), Basketmakers of Victoria (http://www.basketmakersofvictoria.com.au/) and Basketmakers of Tasmania (http://www.tasbasketmakers.org/index.html). You could also keep an eye on the recently formed Basketry NSW Inc (http://www.primrose-park.com.au/Basketry/basketry.html).